Locksmith in Stevenage | 24HR Call out | Fast response | Locked out? Here at Access Denied Stevenage Locksmiths we offer 24 hour 7 days a week service with call outs made within 30 minutes. We also pride ourselves on our services meaning Access Denied Stevenage Locksmiths only use the top brands of locks and workmen. If you’re looking for a locksmith in Stevenage, you have come to the right place. At Access Denied, we pride ourselves on offering professional and reliable locksmith services throughout Stevenage and the surrounding areas. This means that, as long as you’re nearby, we’ll be able to help you with any locksmith needs. Whether you’re struggling with a car lock or a lock to your home, the Access Denied team are on hand to help. At Access Denied, we pride ourselves on offering a wide range of different locksmith services. This means we’re able to help in a number of different ways, regardless of the problem. In fact, we’re even able to help with problems that are complex and confusing. Our locksmith services include helping out with missing keys, lost keys, keys locked in a car and when you’re locked out of home. Whereas some locksmiths in Stevenage focus on providing auto locksmith or property locksmith services, we provide both. When it comes to locks and keys, it’s important to seek out a professional locksmith in Stevenage. Not only does this ensure your problem will be fixed in a professional way, but it also ensures that you’ll receive an unmatched service. After all, there’s no point in paying out for a service that’s anything less than perfect. All of the locksmiths at Access Denied have a wealth of knowledge, experience and skill; this allows us to guarantee a great service at all times. We understand the importance of providing locksmith services in a timely manner, as we know just how much of a delay a lock or key problem can have on your day. Without a fully functioning lock and key combination, you’re sure to find yourself struggling. This could be struggling to get to work on time or struggling to collect the kids from school. To ensure you’re on your way as soon as possible, we complete all jobs as soon as possible. It’s really that simple.To find out more about any of our locksmith services or to speak to a locksmith in Stevenage, get in touch. Have you ever found yourself locked out in Stevenage? If you haven’t, congratulations! You’re one of the lucky ones. Most people find themselves locked out at one point or another, as it’s such an easy mistake to make. Whether you’re locked out of home or you’re locked out of your car, being locked out in Stevenage is nothing to be embarrassed about. In fact, it’s something that happens to the best of us. However, if you don’t have a spare key or someone who can gain access, you’re likely to find yourself in a bit of bother. Luckily, Access Denied are on hand to help. Finding yourself locked out in Stevenage is a huge annoyance, stress and hinderance. Regardless of whether you’re locked out of home or your car, being locked out can put a huge halt on your day. Think about it, when you’re locked out of home there’s no chance of you getting on with your productive day. Similarly, when you’re locked out of your car there’s no chance of you getting to work on time. This is why we always recommend for our customers to have a spare key, though this isn’t something that everyone does. If you’re locked out in Stevenage, we can help. Gaining access to a building or vehicle when you’re locked out is pretty much impossible, especially if you don’t have the professional tools. This is why it’s important to seek out a professional locksmith in Stevenage. At Access Denied, we have professional tools and a great deal of training that allows us to gain access to cars and homes. We’re able to do this without causing further damage and within a matter of minutes, both of which aren’t possible without our expertise. If you find yourself locked out in Stevenage and unsure of what to do, get in touch with us. At Access Denied, we work quickly and efficiently to ensure the problem is fixed as soon as possible. We’re even able to offer locksmith services to those with unique locks, old locks and complex locks. So, what are you waiting for? There comes a time when every lock needs replacing; this could be because the lock is old, broken or no longer secure. Luckily, Access Denied are always on hand to help. At Access Denied, we have a great deal of experience in lock replacement in Stevenage. This means we’re able to help out whenever you need us to. Whether you need a new lock for your home or a new lock for your car, you can count on us. We’re reliable, efficient and extremely hard working. There are a number of reasons as to why you need a lock replacement in Stevenage. For example, you may have recently moved home and want to update the existing locks or you may have lost a key and want new locks to increase safety. You may want to replace an old car lock with one that’s a little more secure or you may want all of your locks at home to match. Whatever the reason is for wanting a lock replacement in Stevenage, we have the tools and experience to help out. We’re even able to replace rare and unusual locks. At Access Denied, we work hard to ensure we’re able to offer an unmatched service at all times. When you choose us for your lock replacement in Stevenage, you really are guaranteed a high quality service that many other companies aren’t able to offer. This is because we frequently update our tools, work hard and only employ the very best locksmiths. It is important for us to provide a great service to our customers, as we believe you should get what you’re paying for. Plus, we want to ensure you come back to us time and time again. As we are a team of mobile locksmiths, we’re able to offer lock replacements wherever you are. There’s no need for you to worry about coming to us or bringing your car in, as we’re quite happy to visit you. All you need to do is give us a call, sit back and wait. We’ll be with you in record time. If there’s one thing we know for sure, it’s the annoyance that comes with a key snapping in a lock. If your key snaps in a lock, you’ll find yourself unable to use that lock or that key. Not only does this mean you’re not able to get in and out, but it also means you won’t be able to lock the door securely. This is why it’s important to seek the help of a professional locksmith in Stevenage as soon as possible. You may think it’s something that’s unlikely to happen, but you’ll be surprised to know that a lot of people find themselves with a key snapped inside the lock. There are a number of reasons as to why this happens, but it is often caused by an old and weak key or by being too forceful. Either way, it isn’t a hard problem to solve as long as you have a team of experts. At Access Denied, we have a great deal of experience with helping out when a key has been snapped in a lock. With a great team of trained professionals, we’re able to solve the problem quickly and efficiently. There are a number of ways we do this, such as issuing a replacement lock or creating a new key. Whatever route we take, you’ll have a working key and lock again in no time. As we are based in Stevenage, we’re able to help throughout Stevenage and the surrounding areas. I’ve Locked keys in car in Stevenage? This is not a problem and is the most common reason we get calls. Our non-destructive methods of entry mean we can open your car in no time at all. Call us now for a call out in as little as 30 minutes by one of our Stevenage Locksmiths from. Access Denied Auto Locksmiths in Stevenage can provide new keys for your car created to the highest of standards again within as little as 30 minutes. Our fully trained team are 24 hour emergency auto locksmiths so you can get to us when you need to. Our Auto Stevenage Locksmiths will always be prompt and professional regardless of the time of day that you call on them. 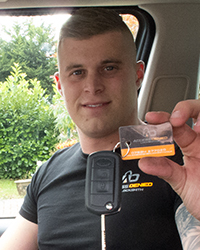 Access Denied have trained staff working all over Stevenage meaning a member of the team of Auto Locksmiths is always within 30 minutes of reaching someone when they call. We will never make you wait longer than necessary to help you out. When you are locked out of your vehicle, your home or your work place, time is of the essence. That’s what makes Stevenage Locksmiths the number one choice for a locksmith in stevenage. Our local presence means we can respond to customers quickly and efficiently, providing the skills and expertise to cover a wide range of requirements. Whether you have lost your keys entirely, or misplaced them, we understand the importance of you solving the problem and resuming your day. Regardless of if you are at work, at home or on the road, the Stevenage Locksmiths team comes straight to you, not only providing you with a new set of keys but also a set of replacements in double quick time. We protect you from individuals attempting to gain unauthorised access by refitting your lock if necessary, ensuring your old keys will not work, whichever hands they fall into. Complications with keys and locks – such as damage, loss or theft – can happen at any time of the day or night. For this reason, Stevenage Locksmiths provides a 24/7 offering, meaning if you require a locksmith near Stevenage or in the town itself, we will be at your service in no time at all. Our friendly team of customer advisors are accustomed to dealing with all kinds of scenarios and will be able to advise you on the best and most secure way forward. We are the locksmith Stevenage has been waiting for, with a policy of no call out fees, and only charging for the labour and parts we provide. With Stavenage Locksmiths, what you see is what you get – that means no hidden add-ons, and an assurance that what we quote you over the phone is the price you will pay. All the work we carry out comes with a year long guarantee, and in the event that any issues do pop up, we will address them immediately. If you live in the SG1, SG2, Areas, Stevenage Locksmiths are your go-to service for all manner of key and lock repairs and replacements.